We decided it's time to give our bidders a better way to buy great advertising and related smalls that seem to come in every big collection we sell. Our new timed auctions will help you do that. Every few weeks we'll give you at least a hundred lots to bid on. The timed auctions will run 10 days to two weeks, depending on how many lots. We hope to be able to give you great collectible smalls that cost less to bid on (lower buyer premium, a flat 15%). Your winnings will cost less to ship and handle. Everything should be able to fit in a USPS Flat Rate priority box. That Flat Rate cost is your cost. There's a modest handling fee, ($7.50) and your things will be shipped quickly, within 48 hours from payment. And you can check out right here on the web site. Bidding is open now and ends at: 5pm on Friday April 5. Give it a try. It's EASY and CONVENIENT! Take a look at these 100 lots. Find your favorites. Place a bid and enjoy your winnings! We're Going Live to the world soon! Check back often for details or Click Here to Sign-Up as a beta-tester! 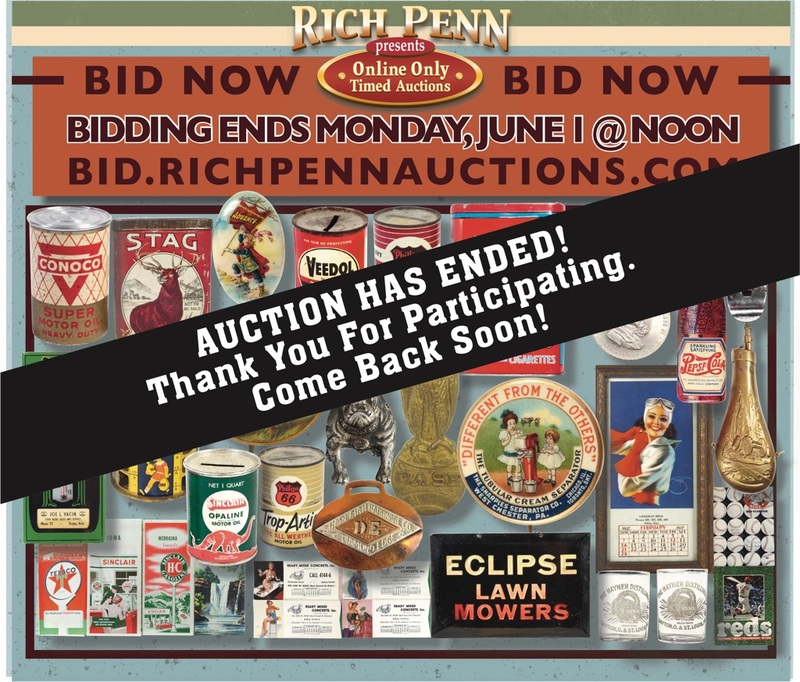 Sign-Up for our mailing list if you want to be the first to know what's new at Rich Penn Auctions.